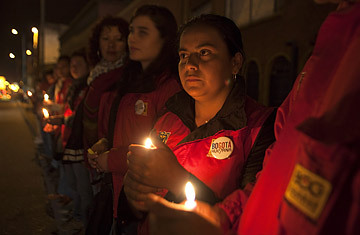 A group of people light candles during a demonstration to protest against the bomb attack against Colombian former Minister Fernando Londono in Bogota, Colombia, May 15, 2012. Tuesday, May 15 was the day Colombia's free-trade agreement with the United States took effect. At 11:15 a.m., however, a brutal message was delivered, reminding everyone of the ugly problems on the home front that the country' has yet to overcome, despite its new status as a regional economic comer. The message came in the form of a powerful bomb that exploded on crowded Caracas Avenue in north Bogotá that killed at least two people and wounded 54. A man wearing a wig and posing as a street vendor apparently attached a bomb with magnets to the hood of an armored SUV that was stuck in traffic. The car was also carrying Fernando Londoño, 68, a right-wing former government minister. The blast decapitated Londoño's driver, killed a bodyguard in the backseat and showered pedestrians with shrapnel and broken glass. Londoño, who staggered out of the vehicle covered in blood, had just finished broadcasting his radio commentary program "The Hour of Truth." Londoño suffered head and chest injuries but was expected to recover. The psychological impact of the blast, however, was harder to gauge. It was the first major terrorist bombing in Bogotá since 2003 and shattered the notion that the Colombian capital stands immune from the drug and guerrilla violence that still plagues remote jungle and mountain regions. The carnage could have been far worse: hours before the blast authorities deactivated a car bomb in a Bogotá slum that was apparently meant to target police headquarters. "What are they trying to achieve? We don't know," said President Juan Manuel Santos after visiting Londoño in a Bogotá hospital. "But terrorists always try to sow panic among the people." Gen. Luis Eduardo Martínez, commander of the Bogotá police force, said there was "strong evidence" that both bombs were the work of the Colombian Revolutionary Armed Forces, or FARC, a Marxist rebel group that has been fighting to overthrow the government since 1964. The FARC has often used conventional car bombs. Though not seen before in Colombia, the type of explosive device used against Londoño was similar to bombs used by the now defunct Basque separatist group ETA in Spain. There have been allegations of joint training between ETA and FARC fighters in neighboring Venezuela, according to Jeremy McDermott, co-director of Insight Crime, a think tank that tracks organized crime and conflict in Latin America. In addition, Londoño received threats from the FARC when he was interior and justice minister in the early 2000s when he helped oversee a military offensive that cut the numbers of rebel forces in half to about 8,000 fighters. On his radio program, Londoño has consistently lashed out at the FARC. "Londoño has been an unflinching critic of the guerrillas and the FARC holds a grudge forever," McDermott said. "But I wouldn't rule anything out." Indeed, some analysts said it could have been the work of dissident members of the military or other extreme rightists who oppose Santos's efforts to reach out to the FARC and hold peace talks. By killing one of their own and blaming it on the rebels, this argument goes, the mayhem could sap support for negotiations. It could also derail efforts by the Colombian Congress to pass a constitutional amendment that would exempt the guerrillas for many of their crimes and allow them to participate in politics if they disarm under an eventual peace accord. "We are not going to allow the enemies of peace  from either the extreme right or the extreme left  to coerce the Congress," said Sen. Roy Barreras, one of the main backers of the amendment. The bombers achieved their short-term goal of disrupting this city of 8 million. However, security has vastly improved in Colombia over the past decade with kidnapping and per-capita homicide rates continuing their downward trend. Although the drug trafficking business remains robust, smuggling organizations these days are smaller and less violent than the cocaine cowboys of Pablo Escobar's era. Despite a recent surge in FARC activity, most rebel operations these days involve land mines and sniper attacks in remote patches of the countryside that have relatively little impact on the overall course of the war or public opinion. These improvements have opened the door to an almost tenfold increase in foreign investment in Colombia to $13.2 billion in 2011. Fueled by oil and coal exports, the economy is South America's third largest while last year's 6% GDP growth could improve even further now that the trade deal with the United States is in place. However, instead of reports on the initial shipments of fresh flowers and other duty-free goods entering the U.S. on the trade agreement's inauguration day, Colombian TV screens were filled with the images of charred vehicles and rescue workers evacuating bombing victims. Besides exposing real flaws in the Bogotá's security, Tuesday's bloodshed will likely dent Santos's image as an adept, man-for-all-seasons who can extend an olive branch to the bad guys while keeping his people safe. It also feeds the perception among Colombians that despite the nation's impressive progress, they will always have terrorism. An editorial Wednesday in the Bogotá daily El Tiempo urged the public not to resign itself to such a situation: "We must not allow the enemies of order, progress and a brighter future to replay the dark episodes of the past." But that's easier said than done. Take the FARC. The rebels recently made headlines with a promise to stop their longstanding practice of kidnapping civilians. But then the FARC turned around and abducted French TV correspondent Romeo Langlois on April 28 amid a firefight with the army. Langlois is still being held.